Type versus Instance Parameters: Whats the Difference? I'm often asked what the difference is between Instance and Type parameters including how and when they should be used in a family or project. I recently found a very useful and informative article explaining the difference on the AEC Bytes website by Shawn C. Zirbes from CAD Technology Center, Integrated Content Solutions. In this article, we will discuss a few topics. First, we will look at the difference between type and instance parameters. Second, I will describe why one should be chosen over the other. Third, I will show some examples of each in use in families. Fourth, we will cover a few of the nuances between type and instance parameters. LEVEL 05-FFL could be used as finished floor level in the Architects model and also in the Mechanical Model. They both sit at the same level in two separate models. When linked together, its hard to see which levels belongs to who, or even if two exists? The unique benefit of this indicator is that it never overlaps the other discipline's indicator. Therefore you can see if the same level exists in multiple models. Confused yet? 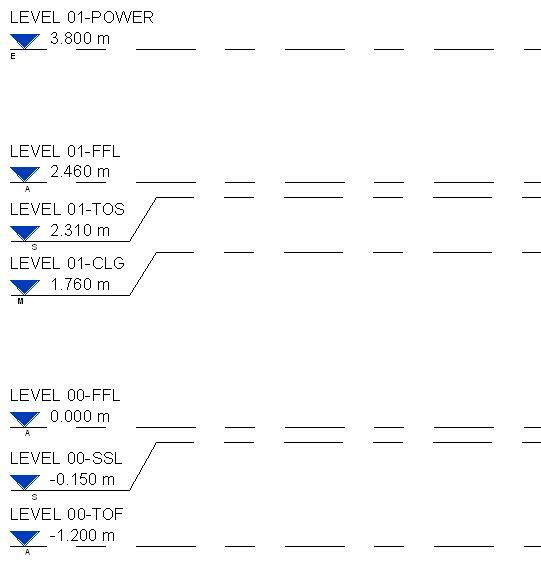 In another example here, we can see that the Mechanical Engineer and Architect both have a Level called LEVEL 01-FFL both sharing the same height and location. The indicator below the level head marker shows M and A to highlight that there are two discipline levels here: One in the Architect's model and one in the Mechanical model. Underneath we can also see the lower level belongs to the Structural Engineer's linked model. ...and the worst case scenario is that all disciplines are adopting the SAME level for reference in their models. In the example below you can see the level head indicates all 4 types are overlayed: S, A, M, E.